What I Wore: 3/28/2011 + Recent Purchases | Oh Sarah O ! 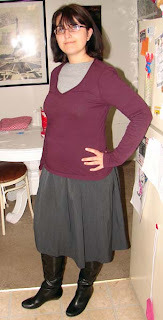 After looking at this photo, I started thinking that I should have either tucked the aubergine shirt into my skirt or moved the belt that came with my skirt on top of my shirt. Oh well! That's what happens when you dress yourself in the dark (literally, the light in the bathroom burnt out and we're waiting for maintenance to come fix it). Let me tell you all, I HATE shopping for pants (and swimsuits, and exercise clothes or anything fussy/ form fitting), so I took a gamble by ordering these New York and Co. pants online and I scored! The material is stretchy but not TOO stretchy and feels very lux. Yay! Tucker for Target shirt- no longer available. Purchased on Ebay. Remember how I said that Tucker for Target wasn't for me (if not, read here)? Well, that's because I hadn't met this shirt sold out at my store before I could get my grubby little mitts on it. 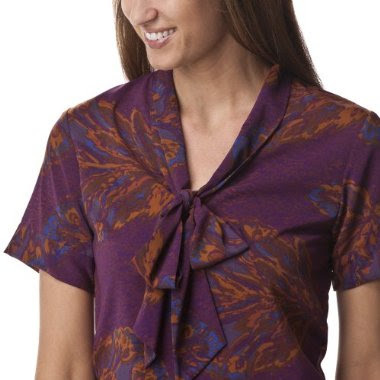 I love the print and can NOT get enough bow blouses. Finally, I picked up a striped cardigan (because I can never have too many cardi's) and a peach shirt for spring. I'd also ordered the basic woven skirt in cocoa, but they weren't kidding when the ad said it was lightweight; the skirt was practically sheer and definitely not work friendly. So it's back off to the Forever 21 store. How was your week? Score any fabulous finds? Let me know in the comments below. I was debating getting the Forever 21 basic woven skirt-- so glad I decided against it! Thanks!